The hard part comes now as we start our hike up the forest ravine with its dense tree cover, a unique Afro-montane forest, during January and February red Disas can be seen en route. For us to enjoy the panoramic views from the top, we have to negotiate a series of wooden ladders which make the more difficult bits a “walk UP the park” but also negotiate the river bed, which flows during winter, here your boulder hopping skills are required, possibly making things a bit more difficult but rewarding once through. Once at the top we continue to the Hely-Hutchenson Dam where we have our picnic lunch and enjoy the fynbos landscape around us. After which we head onto the highest point of the berg, MacClear's Beacon (1086m ASL) named after the 19th Century English explorer Sir Thomas MacClear. We continue along the front end of the eastern table, a special walk as the true beauty of the city is appreciated, the rush of wind and the bustle from far below overtake you as it rushes up the steep cliff face. 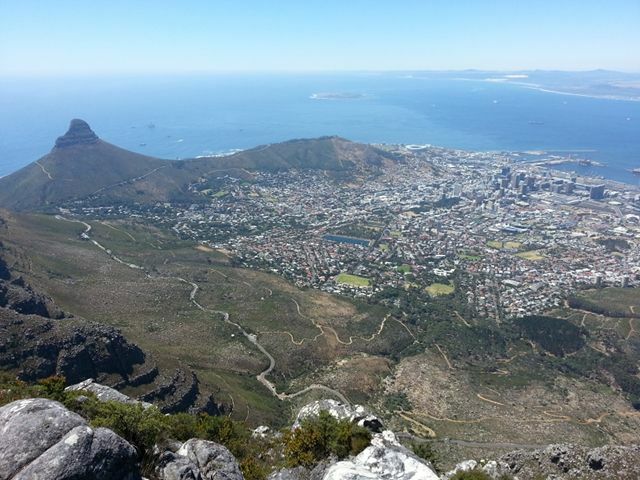 We also get views of Robben Island, Lions Head, V&A waterfront, and the City Bowl. Out hike finishes at the top cable station, before we take the cable car down. You get dropped off at your accommodation again. If you love adventure then have a look at our Hike and Bike the Cederberg package. Skeleton Gorge requires some boulder hopping and then it's easy going. Transfer to and from your hotel. Water for the duration of the hike. If you wish to have something more substantial to eat, please bring along with you. Sun hut and sun block. Minimum 2l of water per person. If you require a rucksack, please let us know. We have limited stock but could arrange something. How do you rate this Tour?